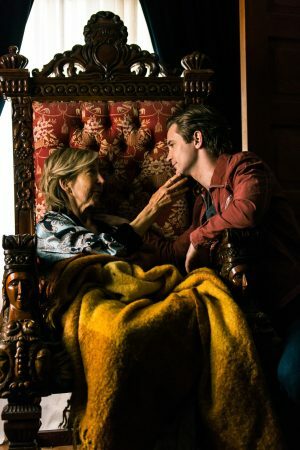 Lin Shaye and MIchael Welch star in THE FINAL WISH. ©Cinedigm. 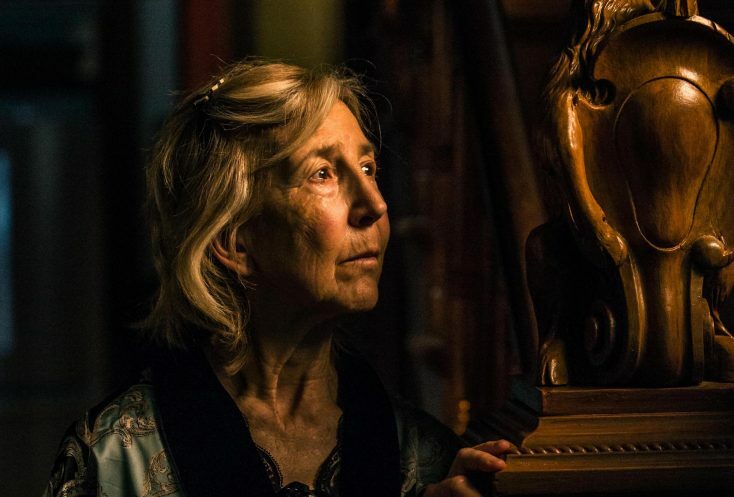 HOLLYWOOD—Lin Shaye initially turned down her part in “The Final Wish,” fearing overexposure in the horror genre. After all, she has become the recurring figure in the popular “Insidious” franchise, and didn’t want to detract from that. The journeyman actress also thought the early screenplay she read about a young man who returns home to his recently widowed mother and finds an ancient statue possessed with a spirit that grants him wishes, was a little too similar to the “Aladdin and the Magic Lamp” myth. But director Timothy Woodward Jr. (“Gangster Land,” “Hickok”), persistently pursued the actress and agreed to accept her input into the script by “Final Destination” scribe Jeffrey Reddick, whom she knew through her brother, Bob Shaye, founder of New Line Cinema, which has produced that horror franchise. Shaye was convinced to play the part and explains by phone she is glad she did. Along with Shaye and Welch, the film also stars Spencer Locke (“Rosewood”) and fellow horror mainstay Tony Todd (“Candyman,” “Night of the Living Dead”). Born and raised in Detroit, Shaye has been an actress for nearly five decades. After attending drama school in New York, where she studied with famed coaches Uta Hagan, Stella Adler and Lee Strasberg, she began her career on stage, appearing as a Polish prostitute in a production of “Hester Street.” Later, she moved to Los Angeles and made her film debut in Jack Nicholson’s 1978 Western comedy “Goin’ South.” Other supporting roles followed in films including “Dumb and Dumber,” “There’s Something About Mary” and “Detroit Rock City.” Along the way, she fell into the horror genre, starring in “Critters” and Wes Craven’s “Nightmare on Elm Street.” She worked on a trio of horror films with director Tim Sullivan, including “2001 Maniacs,” which also starred Freddie Krueger star Robert Englund, and its sequel. Most recently she starred in “Insidious: The Last Key,” in which she reprised her iconic role as fearless ghost-buster Elise Ranier. Q: What interested you about this project? Shaye: Timothy Woodward Jr., who directed it, is a very interesting wonderful guy who was so persistent. I guess he had me in mind for the role, which I’m always grateful for. My manager and agent wasn’t sure about us taking it because I’m trying to be careful about overexposing myself in the genre. I’m still letting them advise me on building my career, which is still growing, gratefully. So, I wasn’t sure about the theme. We basically passed on it, to start with. But Timothy just kept coming back and saying, “Let’s talk about the story.” We kept going back to the drawing board and eventually I felt the answer should be “yes.” His vigilance and determination really played a big part in me finally doing it. Once I signed on, Timothy and Jeffrey (Reddick) were open to ideas I had about the character and the storyline a little bit. Q: I liked it when your character Kate serves her son Aaron dry, cold cereal. Shaye: That was my idea, actually. Originally, she said she was going to make him breakfast and then it cut to him eating a big breakfast. I said, “No, because she already said she didn’t have time to buy groceries.” Sometimes I think writers, as skilled as they can be, often miss a link because, in their head they’re seeing one thing, and when it’s on the page it reads like something slightly different. So, I was really proud of contributing that because it gets a little laugh (from the audience), which is appropriate. What Timothy did, which I really love, is he edited it to that loud crunching of the cereal, making it clear there’s no milk in it. It was dry and crumbly, which is kind of what was in his mouth at that time anyway. I always think of representations of what we’re really feeling through objects as an actress, and I thought it was really appropriate—dry, crumbly cereal in a dry mouth with nothing to moisten and make it tasty. Q: Kate also gets angry with Aaron when she discovers her son is selling off her valuables in a yard sale on her front lawn. Shaye: Yeah. Mothers are often drawn as loving, nurturing—which hopefully we are—and women, in general, are given that position as well as being part of our hormones, you might say, but, boy oh boy, when your kid is doing the wrong thing, the demon emerges. I’ve had it happen in real life and it’s fun to portray that on screen as well. Q: When and where did you shoot this? Shaye: We shot it in a house in L.A. at the beginning of 2018. It wasn’t even a year ago and they hustled to get it out there. All that stuff belonged to the owner. We didn’t have to do much set design. It was pretty much all there, so that was kind of cool. Q: Do you believe in ghosts or spirits? Shaye: I believe in everything. Maybe there was, maybe there wasn’t. I don’t know. You might as well believe a little bit of everything. It was a very inspiring house to shoot in because it was real. It had these old stairways that were going in different directions. It was a weird house. Q: Timothy had worked previously many times with the cinematographer Pablo Diez. Shaye: Yeah, he really gave it a dark and moody look and the shadows play an important part. As an actress, I often look to the DP as well as the director to find out how I’m doing, because they see two different things. The director is looking at performance, obviously. The DP also is looking at the performance but he’s also looking at angles and lighting. Often, they see things in the performance that sometimes the director doesn’t because they’re the ones looking through the lens. So, I’d ask him how a take looked—not short-circuiting Timothy’s observation. Pablo would tell me to tilt my head this way or that. As an actress, you’re thinking about the content, not the position of your head. So, that was great. Q: How was it working with Timothy? Shaye: He was a wonderful director. He was smart and a great storyteller. A couple of times, he pulled me into a different tonality. There’s a scene where I’m running down the hallway when Aaron is about to leave and I want to apologize to him for the way I treated him on the front lawn. In the beginning, I played it like, “Please don’t leave,” and Timothy reminded me that I had been through stuff with (Aaron) so keep it simple. Don’t get emotional. Apologize to him but don’t be solicitous. It was a really good choice and it was the right choice. Q: You have quite a number of projects coming up. What are you most looking forward for your fans to see? Shaye: The biggest event will be “Grudge.” They’re calling it a reboot, which Sam Raimi produced again. It’s based on the Japanese horror film (“Ju-On: The Grudge”) that was made in 2002. It’s a different story using the same idea. It’s directed by Nicolas Pesce. He’s a very interesting, very graphic artist. His film “The Eyes of My Mother,” was the scariest movie I’ve ever seen. I’m not even sure why but it’s the juxtaposition of imagery and a thread that runs through it that is very disturbing. “Grudge” will definitely deliver those elements. I have a fabulous role in it. I’m very excited about it. We shot it in Winnipeg last year. It’s coming out in June. I also did this small film that I co-produced called “Room for Rent.” It’s going to be released in May on all different platforms. We’re going to do a small theatrical run here in L.A. It’s a story about a lonely woman whose husband made sure she stayed lonely for all of the years they were married, under almost slave-like conditions. We meet her after the demise of her husband. It’s her descent into madness which, as an actress, is just fun to play. Another one called “Anderson Falls” is still in post-production. It’s a thriller with Gary Cole. So, there’s a lot going on and I hope I continue to keep going. I love what I do. I’m thrilled that people receive me with such warmth and appreciation because, after all, that’s what your creation is about. It’s for others to feel something maybe special. I’m having the best time of my life right now. I’m getting old, but the thing is, I was never raised with any parameters—gender or age. Even the whole women’s movement thing, to be honest, I have never felt it. I’ve never been rejected or turned away because I was a girl or a woman, and I never thought about it. I was like, “Whatever it is, boy or girl, I’m going to do it.” I’ve always felt the same way about age. My parents were very ageless in the sense that they never made that a condition of who you become. Watching your body change is a little horrifying because you wonder what happened. (She laughs.) But I kind of feel it with love. I appreciate the mechanism because we are really magical creatures. What our body does in one second is just insane, when you think about neurons firing and what goes on in your brain. Just moving your fingers—it’s insane. As an artist, I feel so lucky to be able to comment in a safe way about the way I feel and to try to make people recognize the beauty that we are—for better or worse. Previous PostPhotos: ‘First Man,’ ‘Fuller House,’ More on Home Entertainment … Plus Giveaways!! !